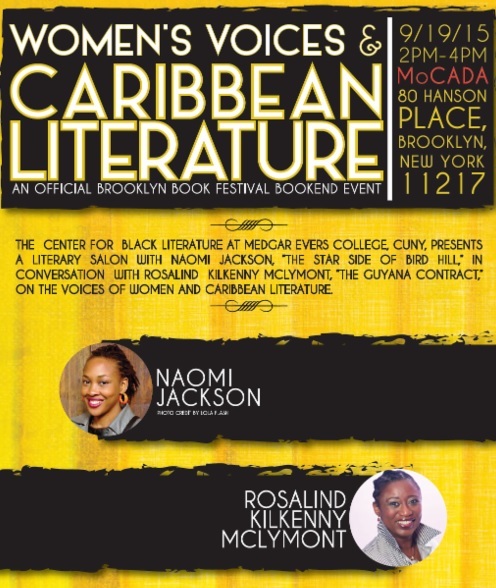 The Center for Black Literature at Medgar Evers College, CUNY—in Collaboration with Penguin Press and The Network Journal—presents A Literary Salon “Women’s Voices & Caribbean Literature” with Naomi Jackson (The Star Side of Bird Hill) in conversation with Rosalind Kilkenny McLymont (The Guyana Contract) on the voices of women and Caribbean literature. The salon will take place on Saturday, September 19, 2015, 2:00-4:00pm, at the Museum of Contemporary African Diasporan Arts (MoCADA). The museum is located at 80 Hanson Place, Brooklyn, New York. This is an official Brooklyn Book Festival bookend event. You must RSVP to ensure space. Recommended donation is $10.00.